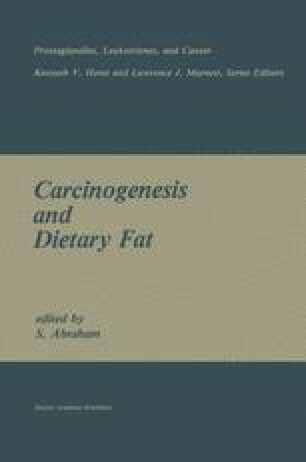 Enhancement of Mammary Tumorigenesis by Dietary Fat: An Endocrine and/or Calorie Mechanism? A number of mechanisms have been proposed to explain the enhancement of experimental animal mammary gland tumorigenesis by hyperalimentation of fat, e.g., modification of prostaglandin biosynthesis and immune system activity, generation of lipid peroxy radicals, changing membrane fluidity and an alteration in intercellular communication. In addition, it has been proposed that dietary fat may influence this tumorigenic process by increasing mammotropic hormone secretion or hormone responsiveness or may act via an increasement of caloric consumption. In this communication, the evidence is reviewed that the dietary fat — mammary tumorigenesis relationship is a function of alteration in: a) mammotropic hormone secretion; b) mammotropic hormone responsiveness and/or c) caloric consumption. In summary, the experimental studies do not appear to support a dietary fat-mammotropic hormone secretion relationship. Evidence is presented that dietary fat may affect mammotropic hormone responsiveness. Data derived from numerous studies support the hypothesis that dietary fat can modify mammary tumorigenesis by a process (or processes) independent of caloric consumption. That dietary fat may influence this tumorigenic process by a mechanism that is caloric responsive is, however, a distinct posibility.